When the weather turns chilly, all I want to do is settle in for the night in front of a warm fireplace with a hot beverage. But sometimes I need to do this out of my own home and in a social environment. So we have created a list of places that will satisfy the need for a toasty warm cocktail or a holiday inspired cocktail that will warm you on those cold winter nights. 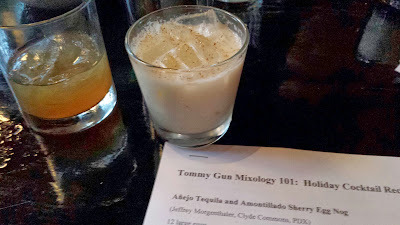 Tommy Gun in Capitol Hill – They make their own eggnog! And in their eggnog cocktail is divine. They also have a large whiskey selection and since brown liquors go hand in hand with the holidays, it only makes sense to go in and try it out! .We recently took a holiday cocktail class there and it was fabulous! Food was great too. Highly recommend it! The Fireside Room at the Sorrento Hotel in First Hill – We could not leave out the fireside room when talking about spots to warm you up in the winter as the grand fireplace here is beautiful. Try the Haute Toddy when you are warming up in the wing backed chairs in front of the roaring fire. Hi-Life in Ballard – Pop into this former fire station to warm up with their holiday cocktail, the Taut Hoddy. And they now serve wood-fired pizza so that could help with the warming up too. 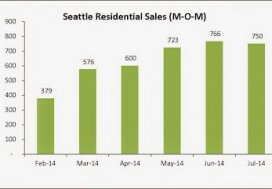 Hot Cakes in Ballard – This place is more than just a bakery and has more than just hot cakes. They have some delicious cocktails as well. Check out the Butterbeer, or perhaps the Extra Dark Caramel, Espresso & Rye or maybe the Chocolate with Scotch & Solerno. Rumba in Capitol Hill – You may think tropical rum based beverages when you think of Rumba but don’t be fooled, they have their fair share of cold weather beverages as well. Try their Hot Buttered Rum, Sano Grog or the Fort de France. Any of these should do the trick! 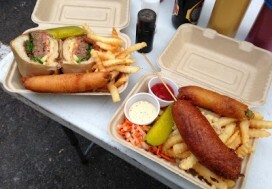 Grog in Ballard – Tucked in behind the Ballard Annex is Grog and as its name suggests, it does have grog! But a more classy version of the orginal sailor beverage of course. Try their hot grog the Brave Walla or the Ben Nevis. Hopefully you will break out of your winter hibernation and check some of these places out!